Mats VD Brand: As rallying is my biggest passion, together with my father who is always there for me and off course my team, my family and the perfect co-driver for me Eddy Smeets, they say what doesn’t kill you, makes you stronger ?! After a brilliant friday evening at the Omloop van Vlaanderen we took a big lead in the M cup and were all good to go on saturday. But even when we put so much time, effort and euro’s in this sport… you can control a lot, but you can’t control luck. Don’t ask me why, but it’s just not our year. Speed is there every rally, and honestly I never drove as fast as I do lately ! Our M3 is handling like a dream.. But still, even when you take care of your car – my baby – this much, it doesn’t mean that it never breaks. My engine – the heart of my love – was so powerfull but last weekend she let us down 🙁 Even when an engine is build with so much love and passion as my supertuner Boschtuning puts in it, doesn’t mean that it never breaks… explodes. I never felt so dissapointed to lose a championship and to lose a rally. But as for East Belgian Rally, I don’t know how at this moment, but we will be there! Eddy Smeets: ELE rally 2nd overall with the Ford Fiesta R5, Ypres FIA historic leading after day 1, GTC Rally and Omloop van Vlaanderen in a nice lead of the M cup… but nevertheless there is a DNF behind our names in those events. That’s four in a row for but bad luck will never get us down. 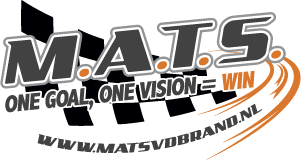 The baseline of team MATS is One goal, one vision, WIN… We start the countdown to the East Belgian Rally. We are fully motivated to obtain a good result there.